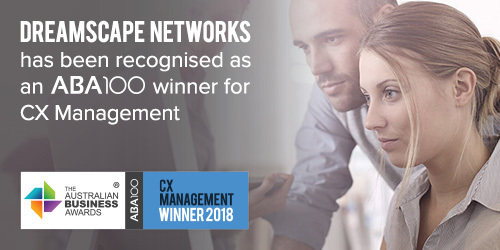 Dreamscape Networks has been recognised as an ABA100 Winner for CX Management in The Australian Business Awards 2018. Dreamscape Networks Limited is a trusted and affordable online solutions provider of domain names, hosting and technology solutions. It owns Australia’s Crazy Domains and Singapore’s Vodien Internet Solutions. It is a leading provider of domain names, online and cloud-based solutions designed to help small and medium-sized businesses (SMBs), build, maintain and grow their business online through licensed domain name registration, cloud hosting services, digital branding and online marketing. Dreamscape Networks is committed to helping businesses and individuals reach their full online potential, working closely with customers and providing the right tools, expertise and professional support to leverage success and growth. Dreamscape Networks Limited (DN8) is a publicly listed company on the Australian Stock Exchange (ASX) and has been listed since the 7th December, 2016. Dreamscape Networks strives every day to attain the company’s mission of becoming the leading trusted and affordable online solutions provider with premium service, BIW (Best in World) service. The customer satisfaction results and continuous improvements year after year guide the company to providing exceptional support experiences to its customers.